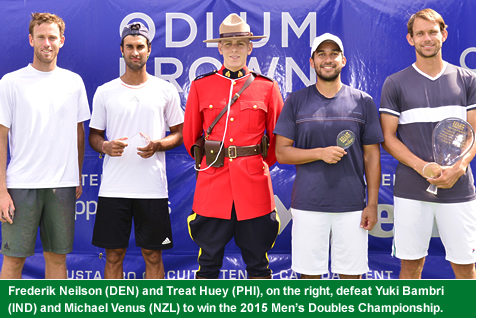 Treat Huey scored his second ITF doubles title as he teamed up with Denmark’s Frederick Nielsen to dominate the Odlum Brown Vancouver Open tennis championships in Canada. The Filipino Davis Cup leader and Nielsen, seeded third, defeated India’s Yuki Bambri and New Zealand’s Michael Venus, 7-6 (7-4), 6-7 (7-3), (10-5) Sunday to take home the $6,200 top prize in the event. On the way to the finals, Huey and Nielsen downed Lithuania’s Ricardas Berankas and Israel’s Dudi Sela, 6-1, 7-5 in the semis; Australians John Millman and Luke Saville, 6-0, 3-6, (10-5) in the quarterfinals; and Japanese Go Soeda and Yasutaka Chiyama, 6-4, 6-1, in the first round. It was the 29-year-old Huey’s second title for 2015 after winning in Estoril, Portugal with American partner Scott Lipsky early this year. He will see action in Salem Open and the US Open at the end of the month. With Briton Dominic Inglot, Huey made it to the US Open quarterfinals in 2013. Currently at 49th in the world from as high as 20th, Huey is also slated to see action for the Philippine Mavericks in the International Premier Tennis League this December.